Camry is consistently not just a leader of the “non-dominant business class” segment, but also a price leader. The used ones are sometimes evaluated above the German premium models of the same years. 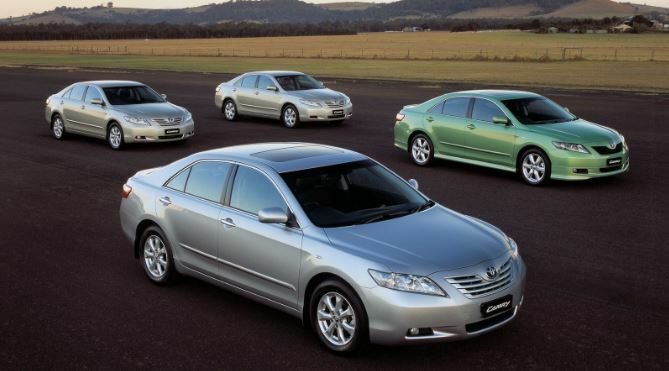 Motorists from all over the world love Toyota Camry, especially Toyota Camry XV 40 2009 . So, is it really worth it? January 11, 2009 in Detroit at the North American auto show was premiered an updated version of the Toyota Camry sedan. The car, which became the most popular model in its class in the US market 11 times during the last 10 years, received a new exterior, improved engines and richer base equipment. So, the changes in the exterior of the petrol version of the model are the following: a new grille and a front bumper, an enlarged lower air intake, large headlamps and updated composite stoplights. Cast discs and caps for steel discs have also undergone modernization. The body metal of the Toyota Camry V40 is quite strong and does not suffer from a reddish disease. During operation, the front optics cap may fade. The salon is very spacious and functional. Even in the basic configuration, there are climate and cruise control, a full electric package, light and rain sensors. Of the main drawbacks, it can be noted that during operation, the roof hatch is often diluted, the center console with the armrest often creaks, besides the armrest itself is not fixed and walks under the elbow. The driver’s seat will be comfortable even for a tall man. There are enough options for transforming the chair, but it would be great to add an adjustment for the angle of inclination. Lumbar support is not super, and the armrest, rather, is designed to store small things than to support the hand. However, in more expensive modifications, all these shortcomings are corrected. On the rear sofa will be also enough space, even for three large passengers, an additional bonus to convenience is the low central tunnel. With the landing there are also no problems – the doors are opened wide. If necessary, you can lower the central armrest, there is a pair of cup holders and ashtrays in the door. The size of the trunk is impressive – 535 l, only if it is heavily overloaded, then the hinges of the lid will remember the load. Horizontal torsion bars also would not hurt to hide under the upholstery. You can open the trunk in three ways. The reserve is high-grade, on casting. The floor of the trunk is just a plywood covered with a cloth. To fold the back of the rear seats, pull the handle with the cable. On the Toyota Camry traditionally put only gasoline. The most common is a four-cylinder engine with a volume of 2.4 liters, there are also 3.5-liter. There are no first complaints about the work. The only thing is to monitor the condition of the cooling radiators, otherwise the probability of overheating is high. In the 3.5-liter engine after 100 thousand there are malfunctions with individual ignition coils, and if improperly used – there may be problems with the failure of the engine itself. Fuel injectors are best cleaned every 30 thousand, otherwise it is difficult to start the warmed-up engine, the consumption of gasoline is increased and the work at idle turns becomes unstable. It should be used only quality oil and the driver should change it at least every 10 thousand km, otherwise the VVT-i phase regulator may suffer, which is expressed by a knock in the unheated power unit. As for the transmission, the five-speed automatic and mechanics are reliable, but in the automatic-six-stage it is necessary to fix the time of oil change, do it every 40 thousand, and change along with the filter. The drive at the car is only front. Why You Should Buy Camry? What is the reason for such a success of this model? It is unlikely that it is in the exterior of the car. It is quite “Central Asian”, although quite characteristic. It does not have the most chic interior. And on the part of technology the car does not surprise at all – all simple and standard: atmospheric engines, simple automatic transmission. Unless the McPherson suspension instead of the multi-lever rear in general can be considered a curiosity, but for Toyota this is just typical. The secret is the combination of reliability and brand image, comfort and a successful pricing policy of the manufacturer. And, of course, in localization and public procurement. The vehicle itself is little, but better than all competitors in the average: it does not have too cheap trim levels, like the Mondeo, the design is calmer than Teana, and the quality of the main units is excellent.